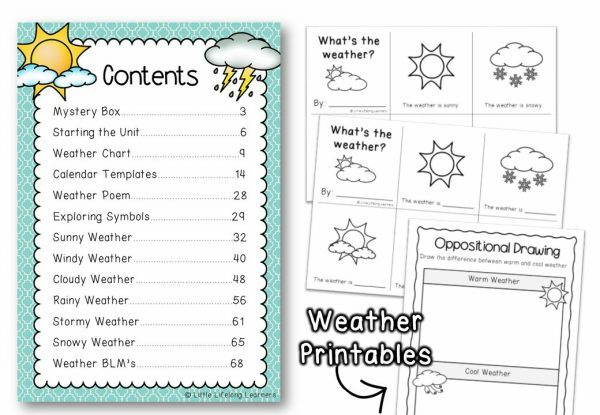 Explore weather and seasonal changes with this packet of resources featuring sunny, cloudy, windy, rainy, stormy and snowy weather! Explore the weather and seasonal changes with your Prep and Kindergarten students! Featuring hands-on activities, art projects, printable worksheets and more, your students will love learning all about sunny, cloudy, windy, rainy, stormy and snowy weather! This packet includes 73 pages of hands on scientific investigations, art and craft activities and play ideas PLUS printable black line masters which will allow you to easily assess your student’s understanding along the way! So what’s inside the unit? 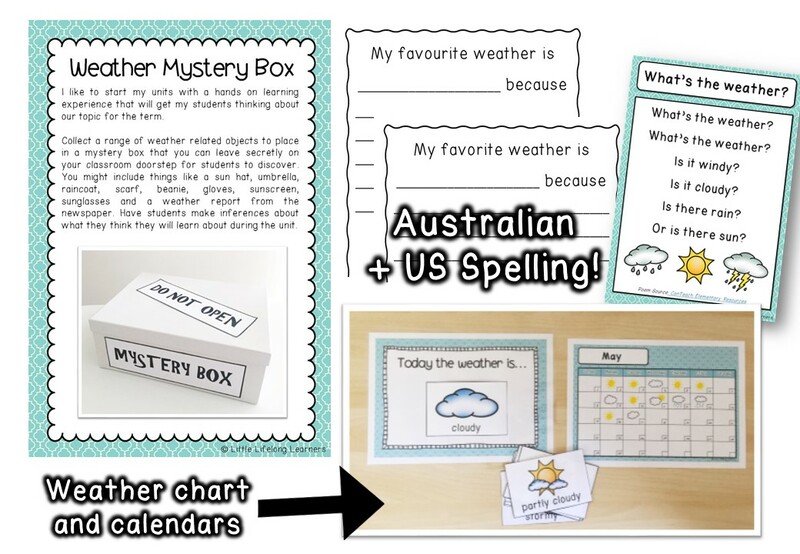 Weather Mystery Box activity to set the scene and engage your learners. Prior Knowledge poster and printables for assessing current understanding. Daily Weather Chart (Today the weather is…) with a calendar for each month of the year for recording the weather. Printables for recording the weather, creating weather symbols and labeling weather pictures. Activity sheets for each weather type – colouring in appropriate clothing, writing tasks, math printables and circle maps. 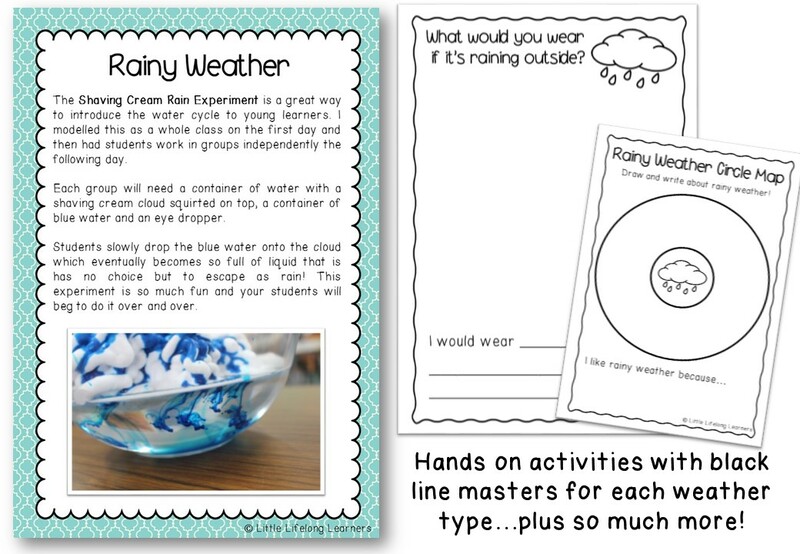 Sunny Weather Experiments – Melting Ice Experiment, Newspaper Experiment, Sizzling Sausages Experiment – all with matching printables. Windy Weather boat experiment with boat plan printable. Cloud art and craft activity which doubles as sensory play! 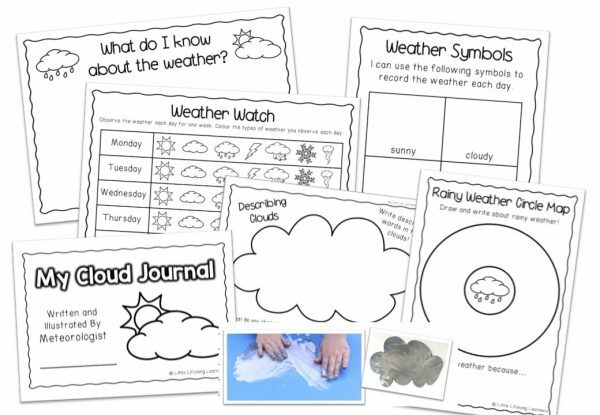 Cloud journal printables for observing and recording cloud formations. Rainy weather experiment using shaving cream and food dye water. Snowy weather activity ideas including making snowflakes and snow play dough! Mini weather sight word book. You will find a range of black-line-masters and printables for each weather type including the designing of weather symbols; labeling weather types; a warm/cool weather oppositional drawing; a printable sight word book; writing tasks; graphing tasks…and much more! Learn about the importance of sunscreen in sunny weather with a fun sausage experiment and explore how rain falls with hands on learning experiences. Your little scientists are sure to love the activities included in this packet! Hands-on experiments and lesson ideas are also included throughout the unit. Specific lesson plans are not included so that you are able to select activities to suit the needs of YOUR little learners. This is what makes the Little Lifelong Learners science units so special! The units are totally flexible while still being jam packed FULL of quality resources and materials!